The NHL’s Free Agency period is a time where mistakes happen. Teams get overzealous, hoping that a big catch will turn their team’s fortunes. Over the years, the poster child for bad free agent signings has been the New York Rangers, who have shelled out big-money, long-term deals to players like Scott Gomez, Chris Drury, Wade Redden, and Brad Richards. In the end, Gomez was traded, Drury retired before the contract finished, and the other two were bought out. The only thing worse than a bad signing, is a bad signing for a team that isn’t even in the running. While it makes sense for St. Louis to spend $28M on Paul Stastny – they have legitimate cup aspirations, it makes no sense at all for Washington to overpay on Matt Niskanen and Brooks Orpik. Washington is barely a playoff contender, nevermind a Cup contender, which makes it the height of tomfoolery for the Caps to spend $66,000,000 on two defenders that may not even play out their contracts. Ultimately, the most important thing for teams to do before they enter the mix in Free Agency is to realistically indentify their Window of Competition. When will your team be ready to seriously compete for the Cup? When business opened on July 1, I think most experts would have agreed that the major cup contenders in the league were Los Angeles, Chicago, and Boston, with secondary favourites being Anaheim, St. Louis, Pittsburgh, and perhaps New York. So what changed between June 30 and July 1? In my opinion, not that much. When it comes to Cup aspirations, the West is still where the big boys play. And most of the biggest players were quiet on July 1. Chicago made a small move, picking up Brad Richards at a bargain, (though he won’t make or break their chances); Anaheim made their big move prior to the draft, getting Ryan Kesler; meanwhile the Cup Champs in Los Angeles did absolutely nothing. In fact, the only major Western team that was really active in free agency was St. Louis, who landed the aforementioned prize of the day, Paul Stastny, giving them the legitimate first line centre they’ve been craving ever since Pavol Demitra left town a decade ago. It was a different story in the East, where the balance of power is starting to shift. Boston took one on the chin, losing Jarome Iginla to Colorado, and with $4.7M in cap overages from last season (Iginla hit too many bonuses), they stand to lose more depth this off-season as they cut costs to stay under the cap. In spite of that, Boston is probably still the class of the East, but even if they made it through to the final, it’s getting harder for them to match up with the very best teams in the West. It’s a similar story in New York, where the Rangers lost tons of forward depth – Brad Richards (buy-out), Benoit Pouliot (Edmonton), Brian Boyle (Tampa), and Derek Dorsett (traded to Vancouver) all left town, leaving several holes in their lineup. They also lost underrated two-way defenceman Anton Stralman, but then replaced him with Dan Boyle. The team that made the biggest impact in the East on July 1 was Tampa Bay. Leading up to the big day, General Manager Steve Yzerman (and co.) made a series of cap-clearing moves, dealing Teddy Purcell and his $4.5M to Edmonton in exchange for Sam Gagner, who was promptly traded 1.5 hours later to Phoenix, along with B.J Crombeen. Then they dealt 4th line centre Nate Thompson to Anaheim for a draft pick. 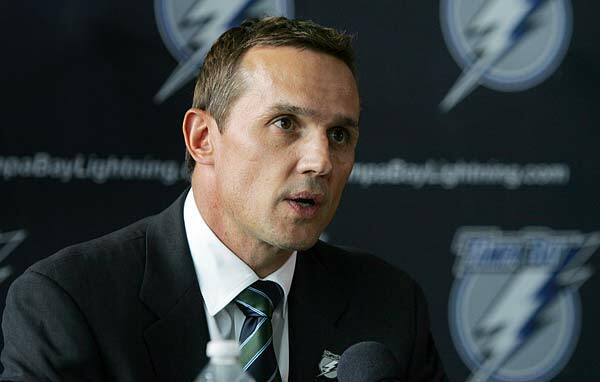 Along with their buyout of Ryan Malone, the Bolts were able to shave about $10M in salaries, which they used to lure Anton Stralman and Brian Boyle – both from the Rangers – and Evgeni Nabokov from the Islanders. (They also acquired Jason Garrison and his booming shot from Vancouver the previous week.) As a result of these moves, and combined with their young, impressive core, Tampa Bay is positioned to be one of the very best teams in the East both now, and for years to come. The other team that made a nice effort to fill their holes was Pittsburgh. In a time where the Washington Capitals were spending money in cavalier fashion (were those contracts for Niskanen and Orpik in Monopoly money? ), the Penguins managed to find bargains in free agency, adding Christian Ehrhoff, Steve Downie, and Blake Comeau, and retaining Marcel Goc, all on very reasonable one-year deals. In all, the Penguins spent about $7M – i.e just over one Niskanen year. As a result, the Pens finally have some depth at forward – something which they’ve been sorely lacking in recent years. With the potential decline of the Rangers and Bruins, they may be back into serious contention in the East. Back to the West – I said previously that the most dominant teams weren’t too busy in free agency, but that isn’t to say that there weren’t some very active teams. In fact, it was the lower-seeded playoff teams that made the biggest charge, led first and foremost by the Dallas Stars. The Stars made the biggest splash of the day, acquiring long-time Senator Jason Spezza in exchange for a package of prospects led by big winger Alex Chiasson. Then they signed dynamic winger Ales Hemsky, who ended last season playing quite productively alongside Spezza in Ottawa. The Minnesota Wild also made a big move, completing a long-rumoured deal with Thomas Vanek, who returns to the area where he played in both junior and College, (and the spot where he met his wife). Lastly, the Colorado Avalanche made a couple of moves, acquiring veteran defenceman Brad Stuart from San Jose, and signing legendary Flames’ Captain Jarome Iginla. While some think Iginla’s contract is a bit rich – three years and over $16M is a lot for a 37-year-old winger – it’s tough to argue with the leadership Iginla will bring to an absurdly young and talented core group which includes Matt Duchene and Ryan O’Reilly (both 23), Gabriel Landeskog (21), and Nate MacKinnon (19). When the dust settled, the West was even stronger than before. Los Angeles, Chicago, Anaheim, and St. Louis are still the class of the bunch, but Dallas, Colorado, and Minnesota are nipping at their heels. (San Jose basically did nothing, but they still look like a solid playoff team). In the East, the early favourites are Boston, Pittsburgh, and Tampa Bay. (Montreal and New York have great goaltending, but they lack the top-end skaters). Chances are this list won’t change much throughout the year, as most big moves are made in the summer when teams can prepare their budget and stay within the cap. The biggest move of the day involving a non-playoff team was Ryan Miller going to Vancouver. It was just over a year ago when the Canucks had Roberto Luongo and Cory Schneider patrolling the crease. Then came Schneider’s surprising trade to New Jersey for the 9th overall pick (Bo Horvat), and then, near the NHL trade deadline, the equally surprising Luongo trade to Florida. Well rest assured Canucks fans, high-caliber goaltending is back with the addition of Ryan Miller. Much maligned over the past year, Miller remains one of the better goalies in the NHL. He doesn’t necessarily get the Canucks into the playoffs given how insane the Western Conference has become, but he certainly keeps them competitive every night. The Jets made one move on July 1, signing Mathieu Perreault for three years, $9M total. At 26, Perreault is a big upgrade on Olli Jokinen, as he is a playmaking centre who will make his linemates better, as opposed to an aging shooter, who wasn’t particularly good at anything besides shooting. Proponents of advanced stats were particularly happy about the move, as they note that Perreault has been amongst the league leaders in points-per-ice-time – while most talented forwards play nearly 20-minutes per game, Perreault has averaged less than 15. As a result, many people feel he can produce more than last year’s 43 points if given more of an opportunity. His slick passing and vision should also help the Jets powerplay, which has never really had a good set-up man working the half-wall. This entry was posted in Free Agency and tagged 2014 NHL free agency, ales hemsky, benoit pouliot, Brad Richards, brooks orpik, Christian Ehrhoff, dan boyle, dave bolland, david bolland, derek engelland, Jarome Iginla, jets add centre in free agency, jets add free agent forward, mathieu perreault, matt niskanen, paul stastny, Perreault jets, steve downie, tanner glass, willie mitchell by Peter. Bookmark the permalink.